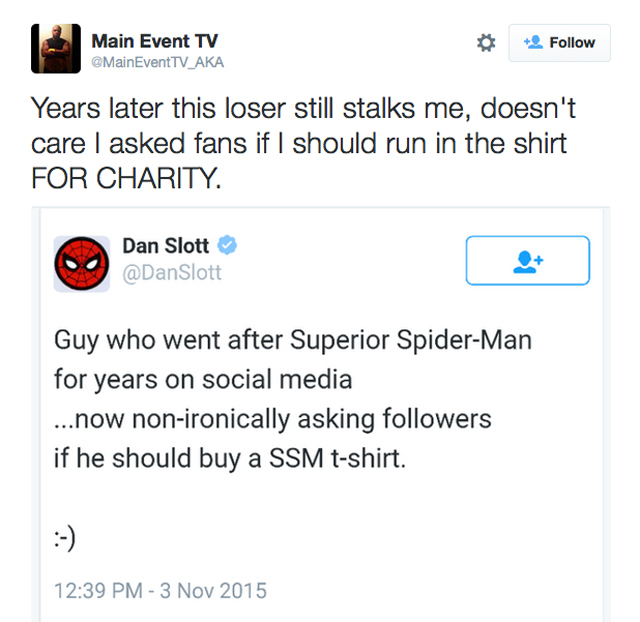 Dan Slott eviscerated after cyber-stalking Philly charity runner; industry ‘journalists’ M.I.A. What does it mean to be a comics industry “journalist”? Does it mean finding and reporting good stories that readers would be interested in, or does it mean reporting only the happy-happy-joy-joy “Ren and Stimpy” versions preferred by publishers? Consider the dead silence over Marvel’s Dan Slott, who cyber-stalked a Philadelphia YouTuber and then exploited the man’s charity event for digital butterfly kisses. Two years ago the Spider-Man scribe was verbally lashed by “The Main Event” after stalking him. Then there was a lull — again, for two years. 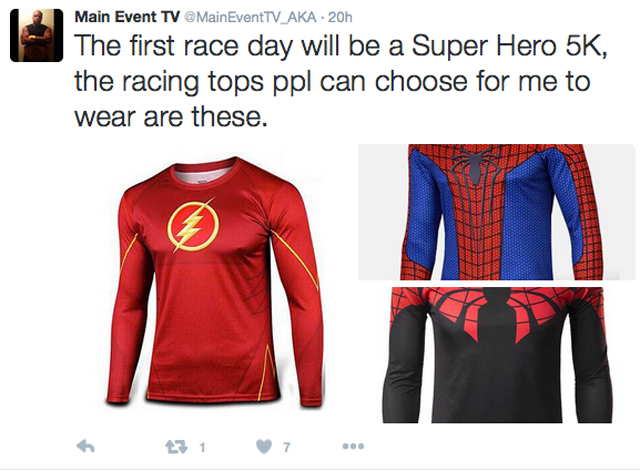 The Main Event asked fans on Tuesday to vote on the shirt he would wear for a 3-day Marvel/Disney-sponsored charity run (5K, 10K, and half-marathon), which set in motion one of the most bizarre chain of events comic fans will see from a creator in recent memory. Dan Slott pounced. He exploited a charity event to receive pats on the back and plaudits from his Twitter followers. Did a close friend request The Main Event use a Superior Spider-Man shirt? Did he even know it was the new costume used by Doc Ock, or did he just think of it as one of 1,000 Spider-Man costume variants created in recent memory? It’s a trick question — none of it matters, because the guy was running for charity and hasn’t said peep about Dan Slott in years. What followed was a YouTube video that comic book “journalists” would swarm like bees on honey if The Main Event were a Lena Dunham lookalike who openly shared LGBT struggles on Twitter. Masculine pro-GamerGate YouTube guy who can eat cyber-stalkers for lunch? Nah. “Journalists” don’t want to jeopardize their access to Marvel writers. The Main Event delivered a rant for the ages on Wednesday. There is a mushroom cloud where Mr. Slott’s head once rested. Piece of s–t, Dan f–king Slott. I see we meet again. … So let me get this straight: You’re going to sit here … and tell your fans half-truths, because that’s what you’re doing right now. You’re sitting her saying I’ve bagged on Superior Spider-Man for years. I haven’t even talked about the f–king thing in years! After those videos, that was it. 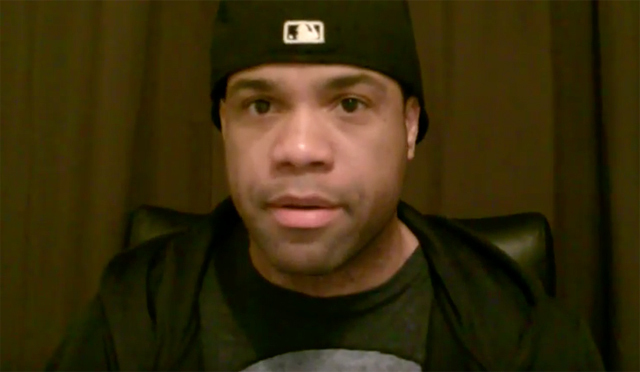 … This man just exploited a charity — a charity — because he wants to fish for compliments! That’s the kind of piece of s–t he is. … There is no excuse for this. The entire response is worth watching, especially since there is an embargo at Comic Book Resources on legitimate news stories that make Marvel editors uncomfortable. Remember: Media bias can present itself in print, but it also is part and parcel of the power to ignore. These are not the droids you are looking for. Move along. Move along. 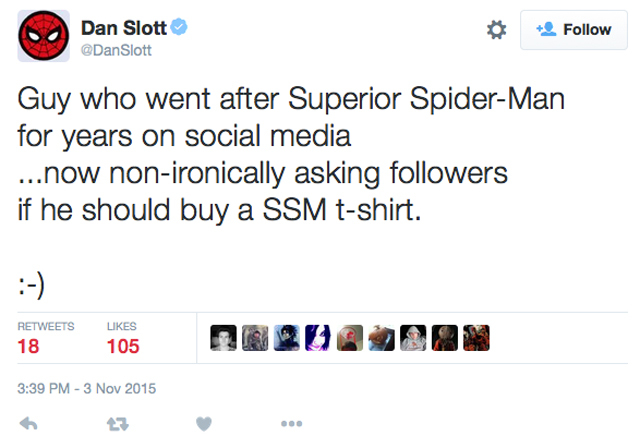 Marvel’s Dan Slott has taken his fear of this very blog to a whole new level. Criticism of The Amazing Spider-Man is now illegitimate if screenshots taken from this blog accompany said feedback. A reader pointed me to recent Comic Book Resources discussion where the writer expertly used his favorite red herring and “poison the well” fallacies. What are people going to remember about “the best selling comic in 2012, 2013, or 2014”? – Will it be SlOtto shooting an unarmed man in the face, while his peers and allies stood around drooling on themselves like idiots? (Because, you know, Spider-man always fought crime with guns and a lust for criminal execution like the Punisher, except for the 50 years of stories where didn’t, and there’s nothing weird about that). – Will it be Peter running around in his web-diaper, in a literal on-panel representation of the painfully regressed man-child he’s become in the dumbed-down, lowest common denominator, post-One More Day comic continuity? – Will it be Peter claiming “wow Sanjani is so right and I’m wrong” as (SlOtto’s) his company crumbles, and he has to be saved from a villian by the likes of Anna Maria and Clash (a character we’re supposed to care about since he was shoehorned into yet another unneeded reinterpreting of Spider-man’s origin)? – Will it be this glorious, gag-inducing panel? HA! Look at that link! You pulled that image from “dougernst.files.wordpress.com” Wow! You went all the way to crazy town for that one. 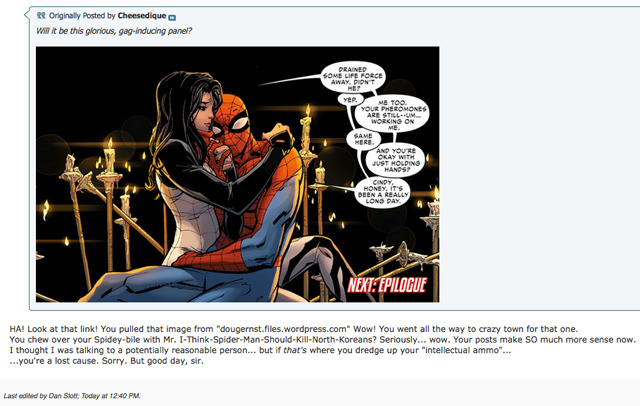 You chew over your Spidey-bile with Mr. I-Think-Spider-Man-Should-Kill-North-Koreans? Seriously… wow. Your posts make SO much more sense now. I thought I was talking to a potentially reasonable person… but if that’s where you dredge up your “intellectual ammo” …you’re a lost cause. Sorry. But good day, sir. The commenter handled Mr. Slott like a true professional. No idea what you’re on about here, man, unless you’re trying to get this thread flagged by the NSA. But way to dodge. 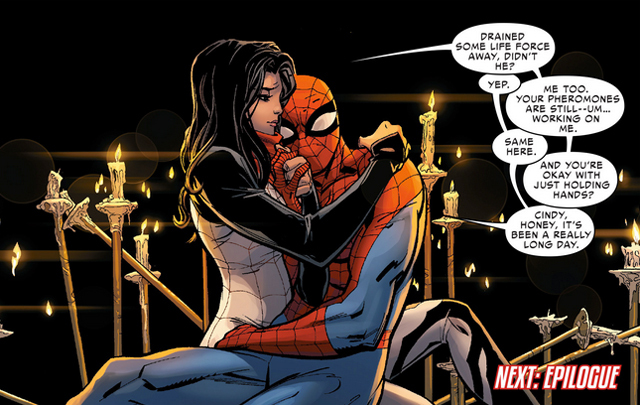 YOU wrote the panel, so you must find nothing icky / silly / ridiculous about Peter and Silk addressing each other and lolling around together like an old married couple. But it’s all just another day in the silly Slott-Verse for us and Spidey. See, I’m discussing content, where you keep dissembling and trying to spin off the topic, so much so that Mets could freely thread drift your posts. Dan. Slott. Nailed. To. The. Wall. Let us speak of intellectual ammunition, shall we? Dan Slott was blasted away by this young man with an intellectual .50 Caliber Machine Gun. As bits and pieces of Dan’s fragile ego exploded off his psyche, he looked for anything that might save him and found some cover just in time — a link to douglasernstblog.com. Dan Slott’s go-to survival technique when faced with punishing critiques is to bring up this blog and then distort things I said — in 2012. Let us pretend this individual did get his intellectual ammunition here. If that is the case, then it is obvious that he is using the kind of nuclear weapons from 2012 that are still reverberating in Dan Slott’s mind three years after detonation. The shock waves from what I’ve said continue to bounce around in Slott’s skull for years, and yet he still strangely attempts to convince others that my reviews of his work are without merit. I wrote a post in 2012 where I said it was ridiculous that Dan Slott’s Peter Parker would be faced with a possible extinction-level event and — when every single second could mean the death of six billion people — he thought it was a wise decision to berate his teammates about the sanctity of North Korea’s gulag overseers. While billions of lives hung in the balance and time was of the essence, Dan Slott’s Peter Parker decided to harangue Black Widow over how she navigated an army of North Korean torturers. Kudos! Years later, Marvel’s ASM scribe is still so emotionally scarred by the drubbing he gets here that he has to frame the debate as if I want Peter Parker to snap the necks of emaciated North Korean women living in rural villages outside Pyongyang. Perhaps if Dan Slott actually read comics like Guy Delisle’s “Pyongyang,” (It’s a good bet that he probably isn’t going to make time for books like “Escape from Camp 14”), then he’d know just how foolish he comes across on CBR message boards. Exit question: If I showed up to defend myself over at CBR and I did so tactfully, then how long would it take before Dan Slott’s moderator buddies banned me anyway?